Hydroponics is a hot trend in the gardening world these days. Growing hydroponically brings the garden to you year-round, whether you live in an apartment or have acres of space. It also allows you to grow disease-prone vegetables like tomatoes in an environment where you can count on less disease, faster growth and higher yields than you would achieve growing them in soil. Hydroponics has a lot of fancy jargon that makes growing indoors seem a lot more challenging than it really is. Let’s break it down to the basics, looking at the best system for growing tomatoes as an example. Hydroponics does away with soil and instead uses growing mediums such as vermiculite, rockwool, gravel, coconut coir, and perlite. Plants grown hydroponically are fertilized directly through a nutrient-rich water solution. Since the plants do not have to waste energy looking for nutrients in soil, root expansion will be smaller than soil-grown plants. Thus, it is possible and even advantageous to have multiple plants side-by-side in a hydroponic system, producing a much higher yield per square foot than growing in soil. Rockwool is the most common medium for starting hydroponically grown tomatoes. With a consistency like “cotton candy,” these cubes are produced from basalt rock and chalk. Because rockwool holds water amazingly well, it allows plants to absorb nutrients more efficiently. You’ll want to start your tomato plants indoors from seed. Introducing soil-grown seedlings to a hydroponic system increases your risk for plant disease. To sow seeds, soak small rockwool cubes in water, and then simply put several tomato seeds in each cube. Place the cubes in a nursery tray with a humidity dome. You won’t need lighting until the seeds sprout, but keep them in a relatively warm spot. Keep the cubes moist during germination. Once your seeds sprout, they’ll need a lot of light. The best way to achieve this is to invest in a grow light. There are several options available, including LED and compact fluorescents. Water as needed during this stage of growth. Once roots have grown through the small rockwool cube, transfer the small cube into a larger water-soaked rockwool cube. Wait again for roots to take hold, then it’s time for your plants to begin receiving nutrients for vegetative growth. 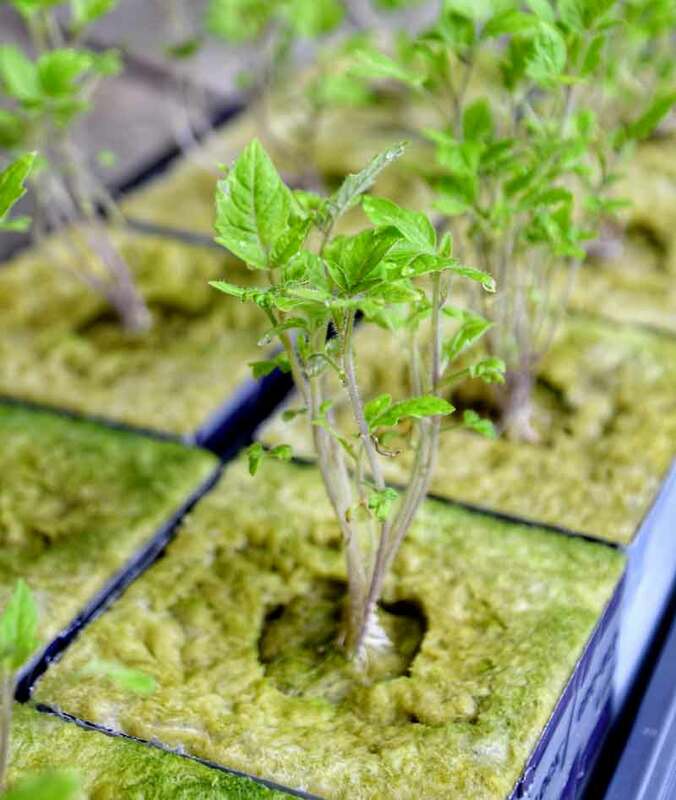 At this stage you’ll need to transplant your rockwool cubes into a bucket system like WaterFarm, Root Spa or AutoPot that uses another growing medium such as clay pebbles. Clay pebbles provide aeration and drainage that will promote healthy growth. Each bucket is fitted with a pump that will ebb and flow nutrient-rich water to your tomato’s roots on a timer, ensuring the plant gets optimal fertilization exactly when it needs it. Tomatoes need eight hours of complete darkness each night. That’s where grow tents come in. They can be closed at night to block any light that may reach your plants, but are also lined with reflective material on the inside that will maximize the light reaching your tomatoes from your lamps. Lighthouse and Gorilla are two of the most common brands of grow tents, and come in a variety of sizes. Transitioning to hydroponic growing allows the grower to produce in a controlled environment with higher yields and productivity. We hope you try growing tomatoes indoors this winter; it’s a lot of fun and the results taste delicious.